Nothing quite says comfort food like mac and cheese. The combination of carbs and cheese is just absolutely irresistible to me, and I cannot deny it to myself. So to keep myself from indulging on the high fat restaurant versions of mac and cheese, I created this Three Cheese Baked Mac and Cheese Recipe that is every bit as decadent as a gourmet version, but for a lot less Points. By using all whole wheat carbs, I was able to amp up the protein and fiber. And the addition of spinach gives it some added nutrition and flavor. I wanted this Weight Watchers mac and cheese recipe to have a mild flavor, so I chose fontina cheese as the base, because I like its delicate, slightly nutty flavor. You could definitely substitute that with a light mozzarella or other type of cheese, if you’d like, and get the Points even lower. The crunch of the Panko on top gives it some added texture and a boost of flavor too. This is definitely a satisfying serving that leaves you feeling very content and your carb/cheese craving tames…for now at least. :) Enjoy! Creamy, mild, and incredibly comforting, this is a healthy mac and cheese recipe that is simple yet satisfying. 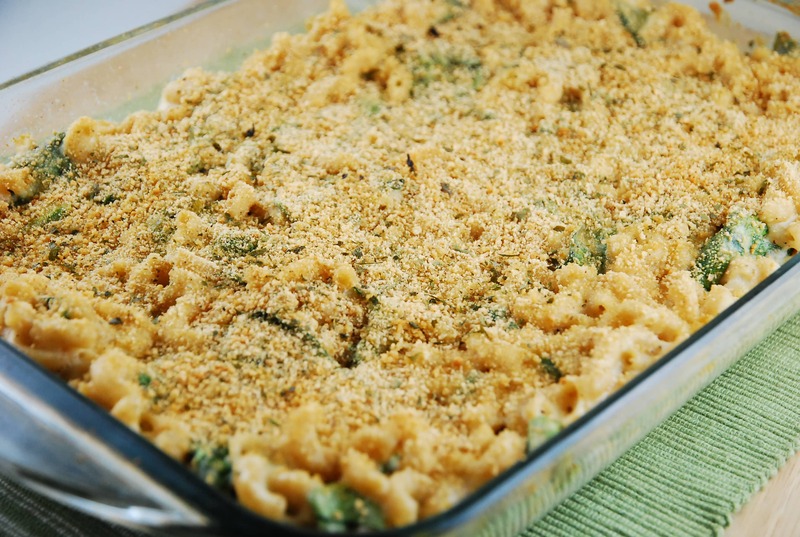 When made with the right ingredients, mac and cheese can be a delicious and guilt free meal to help satisfy those comfort food cravings. While noodles are cooking, make sauce by whisking together milk and flour in a medium sized saucepan over medium high heat. Cook, whisking constantly, until sauce begins to thicken, about 5 minutes. Add in broth and cheeses, and continue to whisk until cheese are melted and sauce is creamy and thick, about 5 minutes. Season with salt and pepper. Drain noodles and return them to the pot. Add the fresh spinach leaves into the hot noodles, and toss until leaves begin to wilt. Pour in cheese sauce and stir well to combine.Transfer to a 13 x 9 baking dish. In a small bowl, mix Panko with garlic powder, parsley, thyme, and salt & pepper. Sprinkle over top of mac and cheese. Place in oven and bake until hot and bubbly, about 20 minutes. I loved this recipe! Because I’m dating a person who doesn’t like baked mac, I stopped right before adding to the baking dish, adding the panko topping, and baking. It was amazing even without, and I’ll definitely be adding this recipe to my list of regulars! I have been looking through your recipes. I don’t see a print button. Is it possible to add one? This dish is my new favorite. I had to substitute greek yogurt for the cream cheese but nevertheless it was delicious.